Being in Ghana for a month I’ve progressively assimilated into the culture more. Or at least as much as possible, with Melissa and I being the only Obronis here (Obroni is the Ghanaian word for foreigner, although often times I feel it is more closely knit to my skin color than my ethnicity). Watching the football games (the European ones) on Saturday and Sunday in a fully packed room, with ManU and Chelsea fans exuberantly cheering on their respective teams. Sometimes they’ll even sing the club songs. Just as much fun though is playing an intramural-esque football game after watching the pros play on Sunday, with animosity between the Blues and Red Devils still high. However, as much as I’m integrating into my local town culture, they can’t help but refer to me as Obroni. Another way I’ve taken part off the local culture, one inevitably part of anyone’s experience in Ghana, is my use of trotros and taxis. Trotros are small buses and the cheaper option, though it seems they don’t exhibit a maximum capacity. Being the preferred mode of transportation for Ghanaians, trotros and taxis make up the majority of vehicles on the road. And with walking as the only other option, I really had no choice to make it mine as well. Taking a taxi back and forth to school every day, I now have come accustomed to the packed backseats and loud atmosphere. In fact, I enjoy it. The taxi and trotro rides also serve as a great analogy for Ghanaian culture. As the people of Ghana are very affable, with everyone wanting to be your brother, sister, or friend, it is no different in public transport. 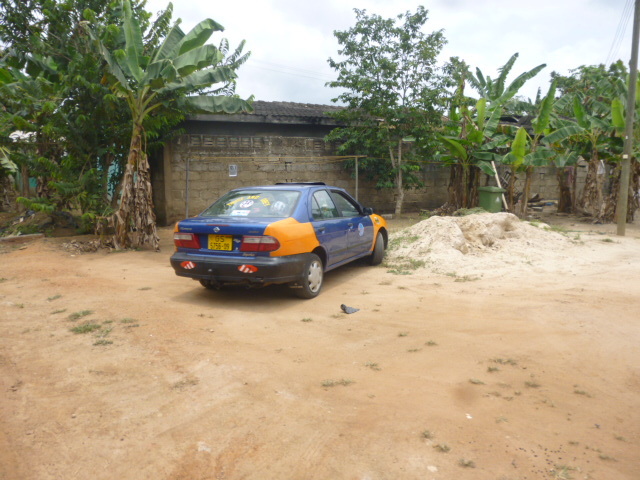 Each ride shows a different aspect of Ghanaian society. With a multitude of religious establishments in each town Ghana is a very devoted country. And even though most drivers decorate their cars with Christian artifacts and trinkets, it isn’t surprising to enter a car driven by a Muslim, evident of the religious divide of the country. Every driver will also have their favorite radio station or cd playing, with gospel, high-life, rap, and reggae as the preferred choices of music, representative of the musical preferences in Ghana. Having so much to look at in each taxi or trotro ride, I often find myself arriving at my destination disappointed that the ride ended, which is surely how I’ll feel coming December. Like the trotro and taxi rides, filled with joy and kindness, Ghana is revealing those same emotions in me. As I now have a steady teaching job at the school, a potential philosophy club on the rise, and a hopeful job as basketball coach in the near future, I’m also becoming more involved at Heritage. And although I often miss the closeness of friends and family, my purpose here more than makes up for that. Today I finished my first week of teaching, which came with many ups and downs. Having little to no experience I was very nervous for my first day and I got up at 7 to put my final touches on the lesson. I had no idea what to expect. My transportation to Heritage involved the usual taxi ride in the morning, which are not hard to find since more than half the cars driving on the road fall into “taxi” category. Arriving around 9 I still had some time to spare and found myself distracted by a competitive game of draft between two other teachers. As it neared 930 I got myself situated to start class. However, when I walked into the room no students were there and once again I fell into the trap of being 20 minutes ahead of Ghana time, as punctuality is not an essential part of the culture. When the classroom started filling up halfway I finally decided to start class having a lot of material to cover. It went flawless. The students were engaged, we finished the entire lesson, and I was able to answer all their questions. 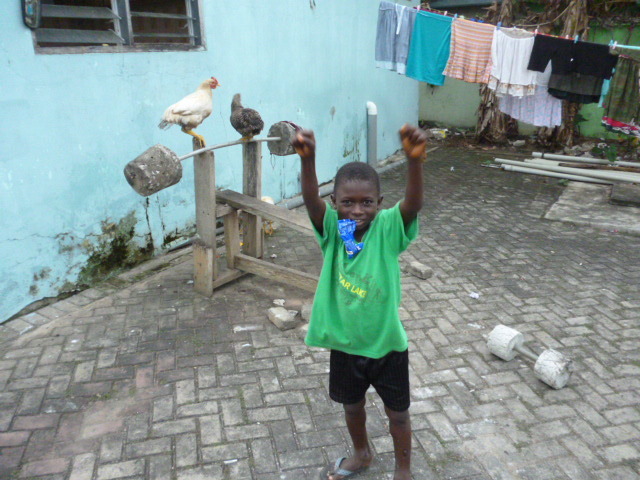 On top of that, the new method of teaching that Kwesi and I are trying to impose was enthusiastically accepted . The typical Ghanaian classroom consists of the teacher speaking and the students listening, while the new Heritage approach involves the students and makes them think critically. Days two and three followed with just as much success. Then came day four… Class started as usual, greeting the students and going over the daily procedures. After the daily introduction it was time to start class and tackle the problems of the day. The way I designed our lesson plan was that the students would get seven minutes to look at the problem, after which we would quickly go over it and move on to the next question. That was the plan. However, instead of quickly moving on to the next question I found myself stuck in a continuous cycle of repetitive questions answered with the same responses. Fifteen minutes of this back-and-forth spectacle passed and matters only got worse. It seemed like the students enjoyed the frustrating halt created in the room and would only tell me that they didn’t get it and the explanation just didn’t make sense. It was here that I discovered my lack of experience as a teacher having no idea how to change the atmosphere in the room. And It was here that I discovered what separates good teachers from the bad. It isn’t the first three days that fly by impeccably. Instead, it is the fourth day, where you have to grind out numerous new methods until you hit the one that makes sense. I couldn’t. I realized that day that I will encounter many obstacles as a teacher and my inexperience will lead to some difficult days. However, I can’t get frustrated. Just as Mr. Koenig said, “take it or leave it. You will run into many difficult teaching moments. Enjoy them, use them to become better the next day, and realize that even the teachers who have come from the US to teach have had their struggles at the beginning.” Now I haven’t found a way to enjoy the struggles I endured that day but I definitely learned from them. 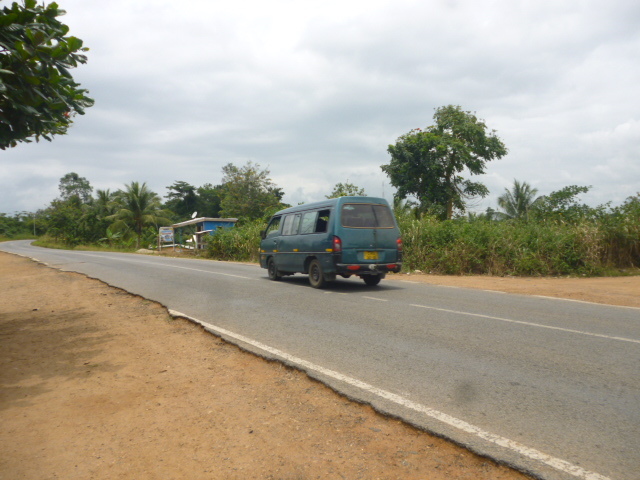 As Michael and I walk along the road that connects Ajumako and Essiam, the two local villages, a brand new Mercedes-Benz drives by. Surprised by the sight I ask Michael whether he knows the man driving the car, assuming he’s of importance, as it’s a rare sight seeing such wealth in our area. “What man?” he replies. Thinking he would have noticed the flashy grey car passing by. I point to it as it rides of in the distance, passing by Heritage Academy, which lies in between Ajumako and Essiam. “The man driving the Mercedes,” I say to Michael. He looks at me with a confused stare in his eyes. Realizing that he has no clue what a Mercedes is I end the conversation and we continue walking to Essiam, our final destination. It is market day in Essiem and I’m looking to buy a watch and some fabric for a dashiki, which are handwoven here for a price unimaginable back home. When we arrive in Essiem it doesn’t take long to find the stand full of watches. It is hosted by two men, one in his twenties and the other much older. 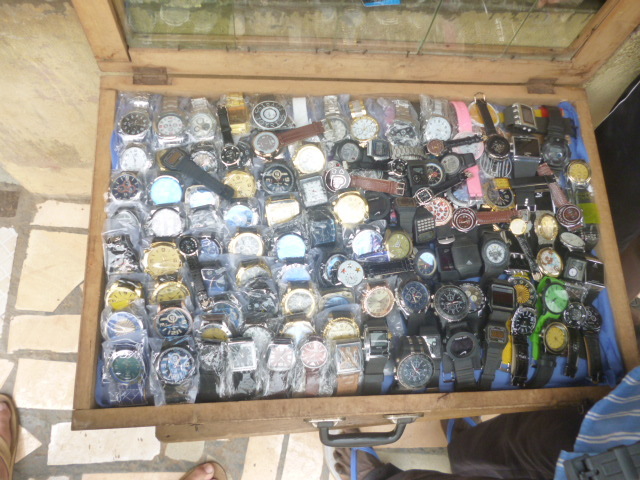 When he opens his vitrine I find myself looking at hundreds of watches, face up in an orderly fashion. Having my mind set on a certain model I pick out an Armani watch that fits the criteria and will hopefully last for me the year. After trying it on, liking the fit, and haggling for a good price I rhetorically ask Michael whether he thinks it’s real. He doesn’t seem to understand the question. So trying to clarify I start pointing out all the luxurious brands in front of me, asking Michael if they are authentic. After having tried at least eight different ones, including a Rolex and an Omega, I finally quit my endeavors and realize that the all so well known brands to me are merely just random names to Michael. It seems that where to me there is a huge difference between a watch from Rolex and a watch from Nike, to Michael only the design is different. It seems that where to me a watch can represent status and wealth, to Michael a watch is just watch. I have started a GoFundMe page in order to start a college fund for Heritage Academy graduates. Almost every student who manages to graduate from Heritage Academy wants to pursue secondary schooling, however a large proportion of them are unable to afford to go because college is too expensive and funding is too low. If you have time and money to spare please check out this link to visit my GoFundMe page, read the description and possibly donate some money. Thank you very much and greetings from Ghana. This is my third day in Ghana and finally I’ve been able to acquire a USB Modem which connects me to the internet as well as my family and friends. My experience has been everything I expected and more. In my first few days I’ve encountered a multitude of cultural differences as the bonfire I came to join turned out to be the slaughtering of a sheep and the local church service woke me up at 2 am in the morning. But besides having such cultural differences, the family and locals couldn’t have given me a warmer welcome. My brother Isaac and sister Victoria (though the bloodlines can get confusing at times since everyone is referred to as “brother” and “sister”) have been an absolute delight. Isaac, apart from being my brother, also serves as my daily alarm clock as everyday before breakfast he’ll come jumping on my bed screaming and laughing in Fante, the local language. And Victoria, well she just turned 11, so besides being a joy to be around, she can be quite annoying at times, but I guess that’s part of the brother-sister relationship, something I’ll have to get used to. My brother Isaac at our local gym. As far as activities go the family has been keeping me busy, and I even managed to get some of the villagers to succumb to some American doings. On my second day, Melissa, my host-mother, decided to take me to the market in my town, Ajumako, which happens every Monday. They sell everything there, literally everything. One stand had Gucci slippers lying right next to some Crocs, as another stand had plastic cups and tomatoes in the same aisle. Not needing anything but still inclined to buy something, I left the market with two tins of tuna and a tub of mayonnaise. The kids had never had tuna salad and probably will not again. Today, as I was just sitting around I decided to go to the Heritage Academy and play some basketball with Odoom, one of our caretakers. It didn’t take long before we had a 3 v 3 basketball game going. Or at least something that resembled it closely since it’s a new sport to Ghanaians. Today I also found out what I’ll be doing at the school: teaching core mathematics and setting up a curriculum for the coming years. A challenge I’m happy to pursue but also nervous to do. The only type of teaching I’ve ever indulged in was tutoring a 7th grader so taking on a full classroom will be very taxing. On top of that the supplies I’ll be teaching with are limited and relatability will be slim, which will make explaining certain mathematical concepts challenging as real-life applications are immensely different. So all-in-all I’ve had a busy first few days, packed with meeting new people and names, eating dishes I’ve never had before (cooked by the most lovely woman named Theresa, who will turn any food into a delicacy), and visiting Cape Coast, the nearest big city. As my adventure ensues I will try to keep up with my blog, which won’t always be easy since power outages are more common than having power and my internet will fall out every hour. I wish all my friends the best of luck in college with Greetings from Ajumako, Ghana. Until next time.